Howard, a rural town, is just west of the Burrum River and 27 km north-west of Maryborough. It was named after William Howard who settled in Maryborough in 1857 and carried out local explorations in the Isis scrub country and the Burrum district. He is credited with the discovery of the Howard coal field in 1876. Coal had been mined on the eastern and western sides of the Burrum River in the 1860s, but river flooding had caused mining to be abandoned. Howard's discovery on land owned by William Whitley on the west bank of the river led to the opening of the Whitley Colliery in 1877. A local parliamentarian secured London finance to expand the colliery and, realising that river transport to Maryborough was too costly, lobbied for a railway. The railway was opened in 1883, by when a restructured company brought out a Scottish engineer, William Rankin, to manage the enterprise. The Howard township developed near the colliery, with a Primitive Methodist chapel opening in 1884, the Royal Hotel opening in 1889 and a Catholic church in 1895. Rankin built his stately Brooklyn House residence in 1890, which is noted for being the childhood home of Queensland's Senator Annabelle Rankin (1908-86). 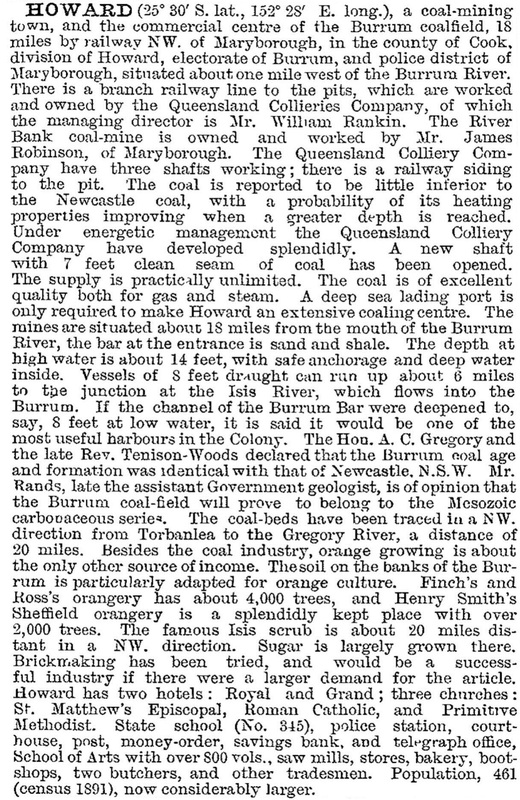 Rankin secured a branch connecting line between the colliery and the main line and the coal was supplied for sugar mills, Maryborough foundries and for coke and gas production. The coal was mostly of good quality and new seams continued to be found. Collieries were also developed on the eastern side of the river at Torbanlea. The Howard power station (1951) continued until 1980, by when coal production was restricted to Burgowan, north-east of Torbanlea. When Burgowan closed in 1997 it was the last mine in the Burrum coal field.